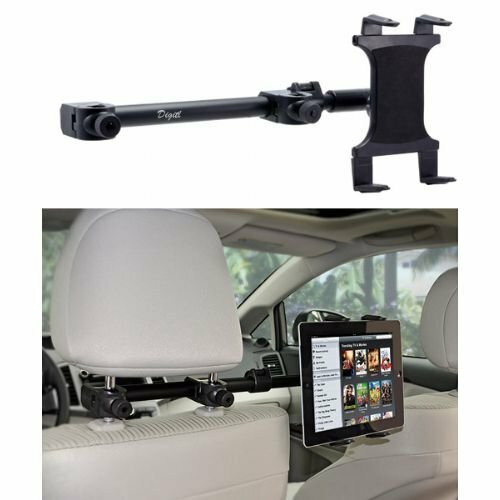 iPad Car Seat Holder - Macally HRMOUNTPRO The Macally HRMOUNTPRO is a dual position car headrest mount designed to hold any 7 -10 tablet wide. Perfect for your children and for your sanity, especially on those long road trips Secure and Stable Strong clamps and also features a support stabilizer arm Car Compatibility Any car with round headrest poles 2 to 9 inches wide (most standard cars) Device Compatibility (with details) * Apple iPad Pro (12.9, 10.5 & 9.7 inch), iPad air /iPad air 2/ iPad 2 /iPad 3 /iPad 4 /iPad mini 1 / iPad mini 2 / iPad mini 3 / iPad mini 4 * Apple iPhone XS / XS / Max / XR / X / 8 / 8 Plus / 7 / 7s 6 / 6s, 5s 5 SE, 4s 4, etc. * Samsung: Galaxy Tab 4 /Samsung Galaxy Tab 3 kids / Samsung Galaxy Tab 3 / Samsung Galaxy Tab A / Samsung Galaxy Tab S / Samsung Galaxy Tab S2 (8.0 inch)/ Samsung Tab ASM-T355C / Samsung Tab ASM-T55/ Samsung Galaxy Tab S2 (9.7 inch) * Samsung Galaxy Note/ Note9 8.4/ S9 / S9+ / S8 Plus * Sony Xperia Z/Z2 tablet * Lenove: ideaPad S5000/ThinkPad Tablet 10/Lenovo Yoga 10 * Acer Iconia A3-A10XZ3 * Motorola Moto * Google Pixel 3 XL 2 * Sony Xperia XZ3 etc. * Kindle Fire HDX * Nintendo Switch * And most other 7 to 10 devices (3 to 8 wide) Worry-Free Warranty At Macally, we believe in our products. That's why we back them all with a one-year warranty and provide friendly, easy-to-reach support for all your questions. Testimonials * Life saver on long road trips! * Works great in the Uber for a Quiz game for the passengers. I guess the kids like it too. * I love love love this product. I installed it, which took a bit to figure out because the instructions are great. However, once I got it together I was very happy. I drive 2 kids under 3 around in a Pontiac Torrent. You can imagine the hair pulling, meltdowns, toy stealing, and book dropping I endured before I gave in and let them watch TV in the car. YOUR PREFERRED ADJUSTABILITY: Choose having your tablet directly behind a car seat for a single passenger or in between the driver and passenger seats for multiple passengers. The ball-head also allows for different viewing angles and for 360 rotation. Statement: Kindly note that this item is suitable for viewing or reading only. It will shake quite a bit and make you uncomfortable if you need to touch or tap the device frequently. However it is inevitable due to some law of physics. Using Tips: 1.When you are holding a heavy tablet, you could try to loop the gooseneck into a S shape or circle shape which would provide some more stability. 2.Bend using two hands and bend just the gooseneck when adjusting the position because it is stiff. Pull the device violently when adjusting may broke the nut. 3.Also, don't overtighten the base clamp too much so it won't break easily. Reinforced Bolt Clamp Base: Reinforced and thickened base. Won't break easily. Fit for 3 inches(75mm) thickness countertop or headboard. Flexible Stiffened Arm: Made of Aluminium-Magnesium Alloy, stiffened material, very sturdy and flexible. Compatibility: Suitable for Apple iPhone iPad or other Android Devices from 4 to 10.6 inches. Minimalistic design, for a simple and stylish way of living. This tablet gooseneck holder is suitable for both tablets and cell phones, totally frees your hands and enable you to pose comfortably. For apple iPhone/ iPad360 degree full adjustable tablets holder stand support for iPad, iPhone, such as iPad 2018 / 2017, 11 inch new iPad pro, iPad 9. 7, iPad Pro 9. 7, iPad Pro 10. 5, iPad mini 1 2 3 4, iPad air 1 2, iPad 5th 6th generation, iPhone 6 6s 6 plus 6s plus 7 7 Plus 8 8 Plus X XS XR XS Max. For android cellphones/tablets Clip / Clamp on tablet holder for 7, 7. 9, 8, 8. 9, 9. 7, 10. 1 inch tablets , such as Samsung Galaxy Tab A 10. 1 10. 5 9. 7 8. 0, Samsung Galaxy Tab S 8. 0 9. 7, Samsung Galaxy Tab S4, fire HD 8, fire HD 10, Samsung galaxy note 9 note 8 S8 S9 A9 Star S8+ S9+ S7 edge S6 edge+, Google Nexus, Motorola, LG, HTC, Nintendo Switch, Lenovo tablets, Asus tablets, Nexus tablets, Dell tablets, LG tablets, Sony tablets. Easy- adjustable tablet/iPad mount iPad stand for business display Tablet clip gooseneck holder Clip on tablet holder for bed Various using occasions: Mount this iPad holder in the kitchen to follow a recipe while cooking, it will protect your tablet from being stained and view at best angle. Mount this tablet iPad holder to bedside, like night stand and headboard, enjoy time with your iPad with hands-free, lying comfortably on the bed. For a switch owner, clamp it to desk/table edge with thickness no more than 2. 7 inches, enjoy a great time with your switch. Mount this tablet holder to desk, table, wherever you want! Please be noticed that this type of tablet holder is good for reading and viewing only. When you tap on your tablet, because of its design principle of structure, it unavoidably bounces and wobbles. In that case, try to Loop The Goose neck arm that closes to bracket into "s" Shape, It will reduce bounce and wobble to some extent. It's suggest use one hand to hold your tablet while the other hand touches screen. Broad compatibility gooseneck tablet holder, compatible with all 4. 7 - 10. 5 inch cell Phones and tablets, such as iPad Mini 2 3 4, iPad Pro 9. 7 10. 5, iPad 9. 7 2018/ 2017, 2018 new iPad Pro 11, iPad Air, iPad Air 2, Galaxy Tab a 10. 1 10. 5 9. 7 8, Samsung Galaxy Tab s 8 9. 7, Samsung Galaxy Tab E 9. 6, Fire 7/ Fire HD 8/ Fire HD 10 tablet, e-reader, Lenovo, Nintendo Switch. Easy to mount & position the gooseneck clamp can be mount to places like bed headboard, desk or table next to your favorite chair. It raises your tablet to your eye level or any other height you want. 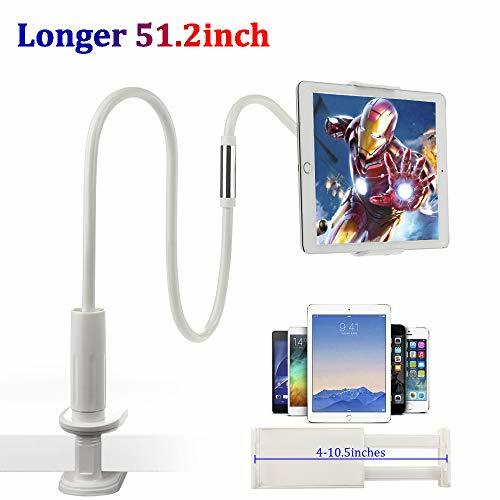 Good for reading and viewing gooseneck tablet mount works as a good partner for your tablet on various occasions, like having face time video call, watching Netflix, reading with Kindle. Also this tablet mount is good for viewing recipes while cooking in the kitchen. Protect eyesight and reduce neck strain with this tablet gooseneck mount, you can keep your tablet at appropriate distance from your eyes. And also ergonomically fix your posture while looking at the tablet. Worry-free purchase If you are not satisfied with your purchase. Just feel free to Contact us. All Lamicall products are backed by 12-month money back or new replacement . Our friendly customer support will find a best solution for you. Using tips 1) when use large tablets, loop The arm (both thick arm and the thinner White arm) into S(as the main picture shows), Z or circle shape helps maintain more stability. 2) use two hands to adjust the arm and do not push it violently, or it will reduce the life-span of the arm and increase the risk of breaking the arm. 3) Put your iPad into the bracket holder vertically, and switch it to landscape position when view. Warranty: Any quality-related problems, we provide 30 days money-back, new replacement within 12 months. Convenient Design One-handed installation and release within 2 seconds. Compatibility of the headrest The distance between two metal posts on your headrest should be 4.9in-5.9in. Compatibility of the device Compatible with smartphones/ tablets/ Switch 4.7-10.5. It is the screen diagonal measurement, not the width. Adjustability Multi-angle rotation to adjust for the best viewing angle. Warranty Whenever there is any quality problem you meet from our product, we will take responsibility and solve it to your satisfaction immediately. Utilizing an adjustable loading button and a revolutionary spring locking system for nearly any tablet, APPS2Car's CD-Slot Tablet Mount will meet your in-car tablet needs. 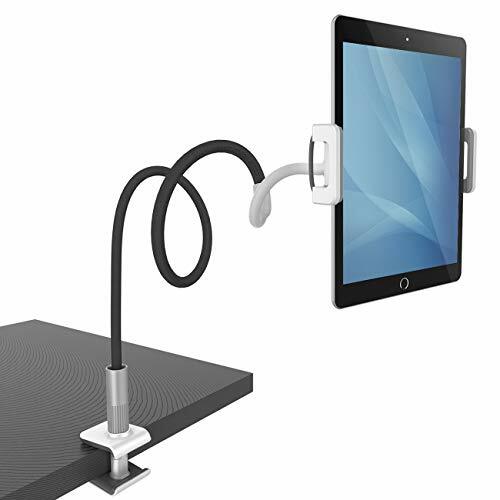 The APPS2Car Adjustable Locking CD Slot Tablet Mount is the result of expert design, utilizing the adjustable & locking mechanisms for mounting nearly any size of industry standard tablet. Featuring some of the strongest materials in the world, our unique design will securely hold your tablet, providing you with the view you need for GPS usage or other in-car uses accomplished while not operating the vehicle (as per local law). The APPS2Car Adjustable CD Slot Tablet mount is made of the most durable high quality materials ensuring you usage throughout the years. Also A CD Slot Phone Mount: Works for most cell phone, such as iPhone XS Max XR X 8+ 8 7+ 7 SE 6S+ 6S 6+ 6 5S, Samsung Galaxy S10 S10+ S10e S9 S9+ S8+ S8 S7 Edge S6 S5 S4, A9 A8+ A8 A7 A6+ A6 A5 A3, C9 Pro C8 C7 C5, J8 J7 J6 J5 J4 J3 J2, Note 9 8 6 5, Google Pixel 3 3XL 2 2XL 1 Phone Nexus 6 6P 5X, Oneplus 6T 6 5T 5 3T 3 2 1, and other 4-7 inch Cell phone. Cable hole design, good for charging your phone. 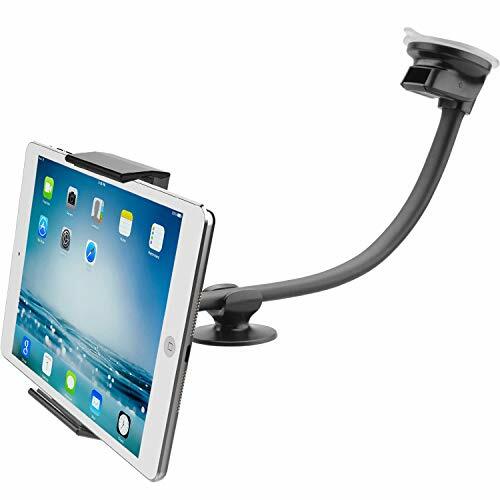 Hands-Free Safe Driving with A Larger Screen of your iPad / Android Tablet for Google Maps and Navigation: Full 360 degree rotation and swivel for your perfect viewing angle, mounting on cd player will be easy to reach your device. Clearing up the car's windshield and dashboard, so it won't block your view of the road. Enjoy Hands-free navigation during your road trip, spend more time at the wheel and eyes on the road. It is amazing to have a larger screen for navigation and you can easy to enjoy off-road entertainment when taking a break on the road trip. A must have for all drivers, especially for Uber drivers, also a perfect gift for friends or family. Worry-Free Warranty: 45 days money back and 24 months item warranty. 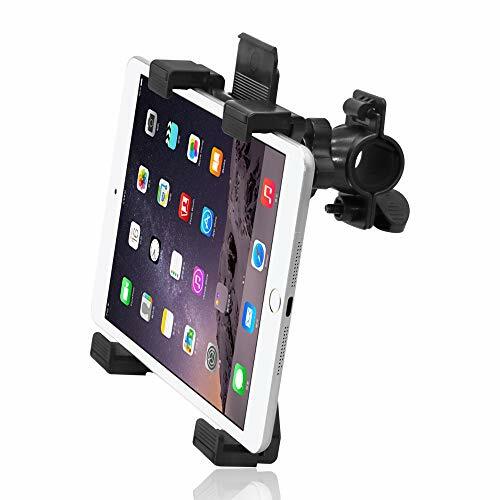 The APPS2Car long arm suction cup mount mounts your tablet securely onto the windshield, and it can be easily viewed and accessed. Keep your eyes on the road - won't block your view! Accommodates tablets & cell phone 4-11 inch. A cable hole at the clamp center, good for phone charging. 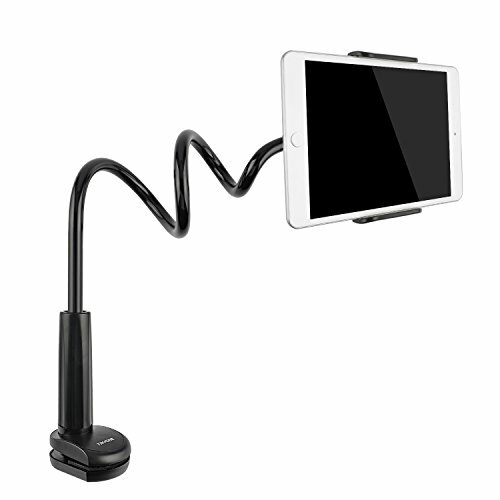 Adjustable long gooseneck and flexible ballhead joint for clear visibility and easy access of your tablet. Rubber padded two-side clamp grips and protects your device securely. Steadier will keep the car mount in place while driving. No tools required. Mounts directly onto the car windshield. Designed without magnets, no harm to your device. It doesn't require metal plates or adhesive residue. Note:Please rinse gel suction cup and let it air dry if it does not stick well. [Also A Suction Cup Phone Mount] -- Works for nearly any cell phone, such as XS Max XR X 8+ 8 7+ 7 SE 6S+ 6S 6+ 6 5S, Samsung Galaxy S10 S10+ S10e S9 S9+ S8+ S8 S7 Edge S6 S5 S4, A9 A8+ A8 A7 A6+ A6 A5 A3, C9 Pro C8 C7 C5, J8 J7 J6 J5 J4 J3 J2, Note 9 8 6 5, Google Pixel 3 3XL 2 2XL 1 Phone Nexus 6 6P 5X, Oneplus 6T 6 5T 5 3T 3 2 1, and other 4-7 inch Cell phone. Cable hole design, good for charging your phone. [Flexible Long Arm] -- Premium extra lengthen long arm made of thick rubberized Aluminum pipe up to 13 inches, make your tablet/cell phone close to you for your easy reach and operation. Especially useful for windshield and unevenness dashboard. [Strong Sticky Suction Cup] -- Two-stage locking suction cup has a sticky gel pad sticks securely to most flat surfaces, like dashboard, wall, table, windshield, window. It can be restored to its mint condition by rinsing it with warm water and allowing it to air dry. [Super Hands-Free Navigation] -- It is amazing to have a larger screen for hands-free navigation during your road trip and spend more time at the wheel and eyes on the road. Full 360 degree rotation and swivel for your perfect viewing angle. It is also perfect for off-road entertainment when taking a break on the road trip. For a simple and convenient life. Car tablet headrest mount for tablets and cell phones from 4 to 11 inch, 7 7 inch, 8 8 inch, 9.7 9.7 inch, 10 10 inch, 10.1 inch, Nintendo Switch. 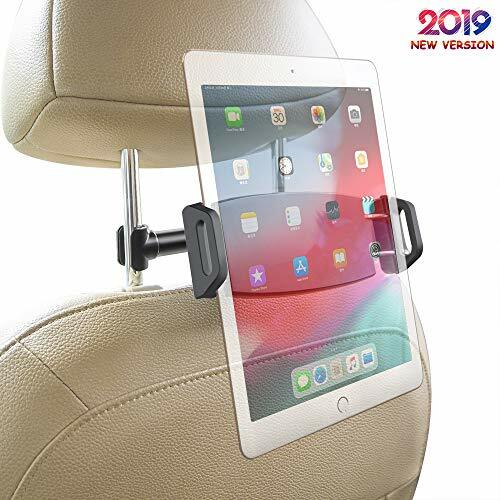 Tablet headrest mount holder for car center / headrest seat compatible with apple iPad, iPad 9.7, Apple New iPad 2018 / 2017, iPad Pro 11 10.5 9.7, iPad mini 2 / 3 / 4, iPad air 2, iPad 1 2 3 4 5 6, iPad 6th / 5th / 4th / 3th generations, iPhone 5s / 5c, iPhone 6, iPhone 6s, iPhone 6 plus, iPhone 6s Plus, iPhone 7, iPhone 7 Plus, iPhone 8, iPhone 8 Plus, iPhone X, iPhone XS, iPhone XS Max, iPhone XR. Car headrest mount rear backseat tablet holder for 7 7 inch, 8 8 inch, 9.7 9.7 inch, 10 10 inch, 10.1 inch, 10.5 10.5 inch, Nintendo Switch, Samsung Galaxy Tab, Samsung galaxy 10.1, Samsung galaxy S3, Samsung S2, Lenovo tablets, kids tablets, amazon fire 7, amazon fire HD 8, amazon fire HD 10, Asus tablets, Nexus tablets, Dell tablets, LG tablets, Sony tablets. Tablet holder headrest mount for iPad, fire 7 8 10, for kids to kill time in car during long travel. Kill boring time on the car - Raise tablet to your eye level, enable you to enjoy a great movie with cell phones or tablets, playing games with Nintendo Switch, having a video talk with friends or families. Non-compatible car models- Honda Odyssey/Pilot, Subaru Forester/Cross trek/Outback, Mazda CX5, Chevy Traverse, 2007 Toyota Prius, 011 Infiniti QX56v, Audi Q7 (2018). The distance between your car headrest posts should be 5.1-5.9 inch. 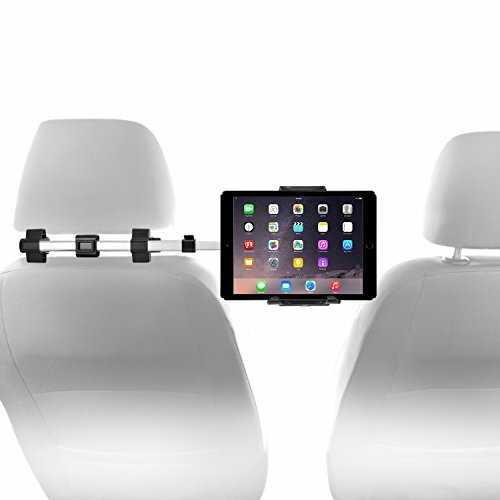 Broad Compatibility Car headrest mount, works with iPad mini 1 2 3 4, iPad pro 9. 7 10. 5, iPad 9. 7 2018 / 2017, iPad air 1 2, Samsung Galaxy Tab A E S, Google Nexus, E-reader, Fire 7 / Fire HD 8 / Fire HD 10 Tablet. Notice: The distance between the two headrest posts should be 5. 1-5. 9 inch. 360 Rotatable & Easy Installation The mount is 360 degree rotatable, allows you to adjust your iPad to any best viewing angle. Just press the arm to mount between the back seat. Anti-friction & Anti-vibration The soft rubber pads protect your device from friction, and the telescopic arm effectively prevents vibration, tightly grip on your back seat. 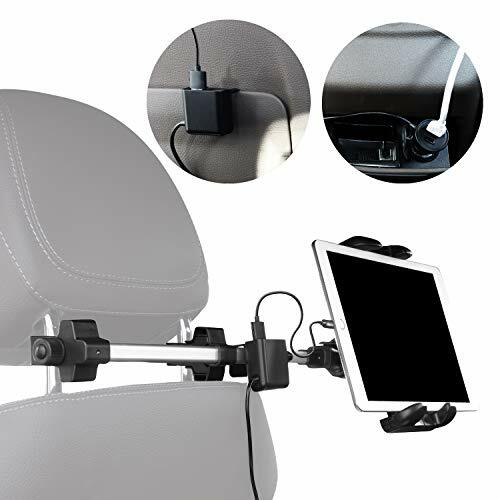 Enjoyable Trip This tablet mount is designed for back seat, mount it between the car headrest to watch movies, read novels, play games and listen to music with hands-free operation during long journeys. Worry-free Purchase- All Lamicall products are backed by 12-momth replacement and refund warranty. Just feel free to contact us if you're not satisfied with your purchase. OPTIMAL MOUNTING SOLUTION: Easily and safely access your smartphone or tablet such as 2017 New Amazon Kindle Fire 7 / Fire HD 8, 2016 Fire HD 7 / HDX 7, Kindle Fire HD 10 Tablet 10.1 7th Generation while operating a vehicle. Secure mount to most vehicle drinks beverage cup holder. EASY INSTALLATION: Expandable base fits most automobiles, recreational vehicles, Car, SUV, trucks and other vehicles with standard size round cup holders. Tool-less and simple installation/removal in seconds. ADJUST & ROTATE: 360 degree swivel ball joint enables ideal and proper viewing angle. SAFE & SECURE: Designed to keep device steady and secure during car rides. Solid construction for minimize road vibration and a 10 inch swing arm for stabilized viewing. Perfect for Uber, Lyft, Truck, Car Pool or long distance navigation drivers. Ansteker Car Headrest Mount Holder dedicate to simply your life and idea with you, makes your life simple and convenient. -Single-arm mechanical design fits 99% of All Headrest Poles,please don't worry about the length difference with the poles. -The considerable bottom hole design allows charging while playing simutaneously. -Keep back seat passengers kill boring time,entertained to watch movies, read novels, and listen to music with hands-free operation on long journeys. -360 maneuverability wide angle allows you vertical vewing and horizontal viewing, or any other angle you desired. -The expandable arms can grasp your car seat and devices firmly, make you feel more at ease while watching movies. 1. Login your amazon account > choose "Your orders" > find the order ID > click "Contact seller". 2. Friendly reminder: If your return window is closed, you can send us an email about your issue. Perfect for Kids & Humanized Design :Great for multiple passengers to watch movies during road trips,which can maintain devices eye level to avoid neck and arm strain for more comfortable viewing experience, also can keep kids or other backseat passengers entertained on long drives.Humanized cable hole design of this car headrest tablet mount is good for charging your phone or insert your earphone. Broad Compatibility :Compatible with all 4- 11 inch devices securely, Ansteker car headrest mount holder fits for iPad air / iPad/ iPad mini / iPad Pro(NOT for 12.9'' iPad Pro),Kindle Fire HD, Google Nexus,Nokia Tabs,E-reader,Huawei Tablet,Nintendo Switch, Asus Zenpad,Samsung Tabs/phones,etc. Maximum Device Thickness Supported of the car seat tablet holder- up to 0.59 inches (15mm). 360 Rotatable Adjustability & Easy Installation :Multi-angle rotation allows a wide range of different position to adjust for the best viewing angle you desired. Single-arm mechanical design fits for most car headrest, you needn't adjust the length to fit distance between two poles of car headrest. Just quickly and securely install the car headrest mount phone & tablet holder onto the headrest of any car, and release the tablet/phone at the press of a button. Secure & Stable Protection :The soft rubber pads protect your device from vibration and scratch, and reinforce friction in between for stronger grip and withstand looseness and drops.Robust mechanical design of the Back Seat Bracket can tightly grip on your back seat. 100% Warranty and Service : If there is any quality problem on this Car Headrest Mount, please let us know and we'll try our best to make things right.Enjoy this absolutely RISK FREE purchase by clicking the yellow Add to Cart button. Compatibility: Suitable for IOS or Android devices from 4.7 to 7.9 inch width. Perfect companion for nice car journeys ! 1,Adjust your car headrest to the best position . 2,Hook the mount to headrest poles ,please be sure the car tablet mount is firmly fixed . 3 Align the points connector with the holes and rotate the mount until hearing a click, put down the button showed in pictures ,now done . 4,Adjust the clamp arm to the tablet right size ,put the tablet into clamp ,to be 360 swiveled , just adjust view angles as you like . 5,Compatible with all tablets 7 - 12.9-13inches with full access to all buttons and ports . 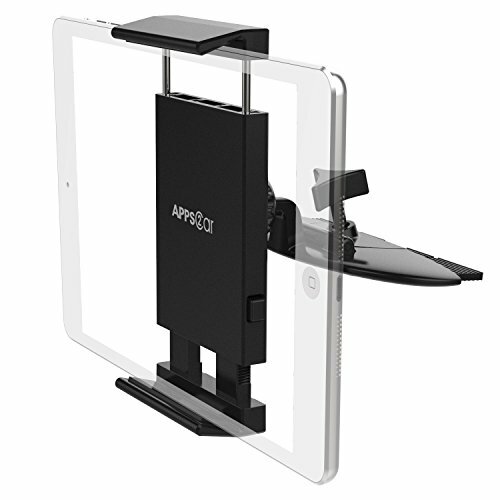 WIDE COMPATIBILITY: Secure compatibility with all 7-13 devices for iPad air / iPad / iPad mini / iPad Pro, Kindle Fire HD, Google Nexus, Nokia Tags, eReader, Huawei Tablet PC, Nintendo Switch, ASUS Zenpad , Samsung labels, etc. Maximum device thickness support for tablets - up to 0.98 inches (25 mm). ADJUSTABILITY: Multi-angle rotation allows for a variety of different position adjustments to get the best viewing angle you want. 100% WARRANTY AND SERVICE: 30-day money back guarantee and 1 year replacement warranty. If there is any quality problem with this car seat, please let us know and we will try our best to do our best. 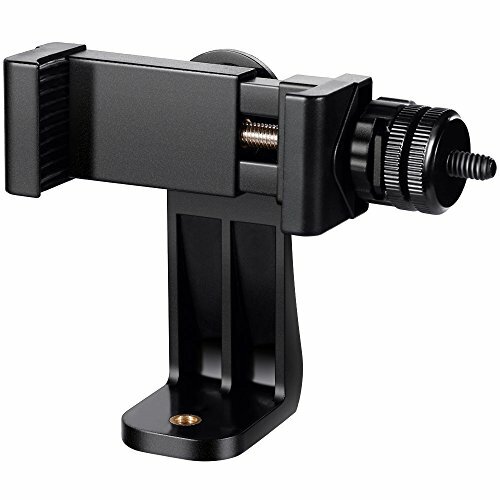 Specification Mobile phone clip size: 58mm- 105mm weight:120g Interface: International standard screws 1/4 Material : plastic Package included: 1*Vastar Tripod Adapter 1*Vastar hot shoe Warranty: 18-month warranty. For any question, please feel free to contact us. We will get back to you within 24 hours. Our premium headrest mount for tablets, is ideal for viewing and entertaining multiple passengers at the same time. It features an adjustable rigid extension arm that positions the tablet in the center between the two seats. When the mount is not being used you can simply flip up the tablet and slide pole back into start position. The top and bottom adjustable leg holder design fully secures your device while giving full access to all charging and headphone ports.Hassle-free easy install and mounting makes the Jarv headrest tablet mount holder one of a kind. OMOTON: Aluminum Adjustable (210 Degree Rotatable) Tablet Holder Cradle for All Smart Phones, E-readers and Tablets such as iPad Pro 9.7, iPad Pro 10.5, iPad Pro 12.9, Samsung Galaxy Tab, Fire Series and all iPhones etc What makes this stand superior? Steady Base With the nano-adsorption sticky suction mount base, it can provide the most stable hold for your tablets and cellphones. Prevent skid even on 75 degree slippery slope. The sticky base can be moved to other place without leaving a mark and it's easy to clean with water and the adhesive remains. Wide Compatibility Compatible with all the tablets, mobile phones and e-readers, even with the smart case on. Multi-Angle This tablet stand can conveniently adjusts to different viewing angles, ensuring you can enjoy the most comfortable viewing. Thoughtfully Design The anti-scratch and anti-slip silicone pad can provide you comprehensive care. It's convenient to charge your device with the charging port design. Superior Material Made by Premium Aluminum Alloy, Lightweight but Solid. With the advanced manufacturing technology, you could enjoy the comfortable sense of touching and OMOTON provide you one year warranty. Typical Compatible Devices: Tablets: iPad Pro 12.9/ 9.7, iPad Air 2, iPad Air, iPad Mini 4/ 3/ 2/ 1 etc Samsung Galaxy Tab 4/3/2, Tab S3/ S2, Tab A, Samsung Tab E etc Amazon Fire Series Tablets Cell Phones: iPhone 7 Plus/ 7, 6S Plus/ 6S, 6 Plus/ 6, SE, 5S, 4S Samsung Galaxy S7, S6, S5, Note 5, 4, 3, 2 Google Nexus 6P, 5X, Pixel, Pixel XL All other similar devices from 3.5 inch to 12.9 inch OMOTON, Better than you Expect! Portable:5.9-inch diameter makes it easier to be placed in your bag or bigger pocket when you want to take it to other places. Adjustable:270 degrees rotating allows you adjust the angel according to your device size to keeps it at a perfect viewing angle. Stability: Made of solid metal material, steady construction thanks to unique round base. Solid and sleek looking. Anti-Slip: Non-slip rubber pads for grip, has grip pads on the part that the device leans against. Four rubbers distribute symmetrically at bottom keep the unit from slipping all over the place. Compatibility: Compatible with cellphones and tablets in 4-10.5 inches, although with case. Lamicall dedicate to sharing minimalistic idea with you, makes your life simple and convenient. This tablet gooseneck holder is suitable for both tablets and cell phones, totally frees your hands and enable you to pose comfortably looking at your phone. 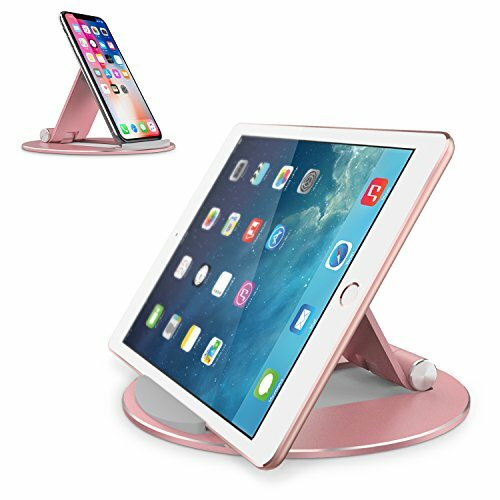 360 degree full adjustable tablets holder stand support for iPad, iPhone, such as iPad 2018 / 2017, 11 inch new iPad pro, iPad Pro 9.7, iPad Pro 10.5, iPad mini 2 / 3 / 4, iPad air 2, iPad air, iPad 6th 5th 4th 3th generation, iPhone 6, iPhone 6s, iPhone 6 plus, iPhone 6s plus, iPhone 7, iPhone 7 Plus, iPhone 8, iPhone 8 Plus, iPhone X, iPhone XS, iPhone XR, iPhone XS Max. Holder for 7, 7.9, 8, 8.9, 9.7, 10.1 inch tablets , such as Samsung galaxy note 9 note 8 S8 S9 A9 Star S8+ S9+ S7 edge S6 edge+, Google Nexus, Motorola, LG, HTC, Nintendo Switch, Samsung Galaxy Tab A 10.1 10.5 9.7 8.0, Samsung Galaxy Tab S 8.0 9.7, Samsung Galaxy Tab S4, Lenovo tablets, Asus tablets, Nexus tablets, Dell tablets, LG tablets, Sony tablets, fire 7, fire HD 8, fire HD 10. Mount this iPad holder in the kitchen to follow a recipe while cooking, it will protect your tablet from being stained and view at best angle. Mount this tablet holder to bedside, like night stand and headboard, enjoy a great movie with your iPad with hands-free, lying comfortably on the bed. For a switch owner, clamp it to desk/table edge with thickness no more than 2.7 inches, enjoy a great time with your switch. Mount it to desk, table, treadmill, even bench in the park! Notice - Please be noticed that this type of tablet holder is good for reading and viewing only. When you tap on your tablet, because of its design principle of structure, it's normal if it bounces and wobbles. Broad Compatibility Gooseneck tablet holder, compatible with all 4.7 - 10.5 inch cell phones and tablets, such as iPad 9.7 2018 / 2017, iPad pro 9.7 10.5 11, iPad air, iPad air 2, iPad mini 1 2 3 4, Samsung Galaxy Tab A S E, Fire HD 8 / Fire HD 10 Tablet, E-reader, Nintendo Switch, iPhone XS Max XR X 8 8 plus 7 7 plus 6 6s plus, Google Nexus. Notice: This lazy mount does not fit thick cases. Please make sure the thickness of your device is no more than 12 mm. Easy to Mount & Position The gooseneck clamp can be mount to places like bed headboard, desk or table next to your favorite chair. Worry-free Purchase All Lamicall products are backed by 12-month money back or new replacement warranty. If you have any concerns about your purchase, just feel free to Contact us. Our friendly customer support will find a best solution for you. Set the tablet iPad holder between in car headrests, firmly hold your device, no worry about drop at all, No tools required, easily attaches, mount the headrest in seconds. , for kids to kill time in car during long travel. Fits cell phone with screen size ranging from 4.7" to 7" inch. iPhone XS/XS Max, iPhone X/XR. Fits tablet with screen size ranging from 7" to 13.5" inch. amazon fire HD 10, Asus tablets, Nexus tablets. Dell tablets, LG tablets, Sony tablets. The distance between two metal posts on your headrest should be 4.95 in-5.9 in.The thickness between the metal pillar and the back of the chair is 2.2 in. Please confirm the size and then order. UPDATE VERSION Car Headrest Mount Holder Improved Version of 2019, added rear wing for easy finger stretching. Increase the thickness of soft rubber cushion to 3MM to protects your tablet from scratches to ensure the stability of your tablet and thus greatly increase it's safety index. High quality Car Headrest Mount Holder Best-in-class quality and more strong arm ensure the tablet holder steady fixed on the headrest. Soft rubber cushion keep your device from scratch and dropping down. specially reserved two holes in each side allow you to use charge cable and headphone. 100% SATISFY GUARANTEE Please kindly notice that the distance between two metal posts on your headrest should be 4.33 in~5.9 in. Contact us if you are not satisfied with it Car Headrest Mount Holder, we will provide full refund or send you a replacement without any reason! 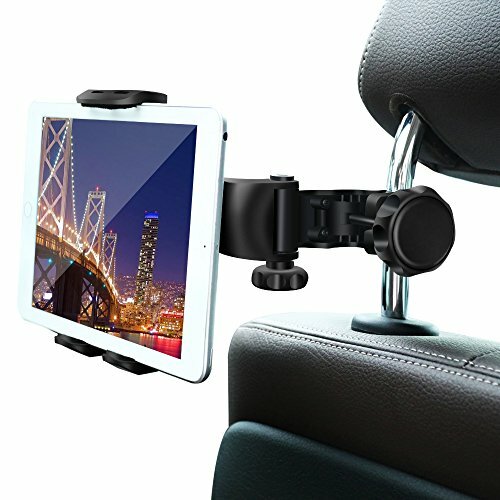 Universal Compatibility car headrest mount is suitable for all 4.7-13.5 inch devices,such as iphone/ipad/ipad mini/ipad pro/google Nexus/Nintendo Switch/kindle.Unique two-side flexible arm mechanical design fits for most car headrest. [Also A Car Cupholder Phone Mount] -- Works for nearly any cell phone, such as iPhone XS Max XR X 8+ 8 7+ 7 SE 6S+ 6S 6+ 6 5S, Samsung Galaxy S10 S10+ S10e S9 S9+ S8+ S8 S7 Edge S6 S5 S4, A9 A8+ A8 A7 A6+ A6 A5 A3, C9 Pro C8 C7 C5, J8 J7 J6 J5 J4 J3 J2, Note 9 8 6 5, Google Pixel 3 3XL 2 2XL 1 Phone Nexus 6 6P 5X, Oneplus 6T 6 5T 5 3T 3 2 1, and other 4-7 inch Cell phone. Cable hole design, good for charging your phone. [Sturdy Adjustable Arm] -- Premium 9.5-inch adjustable arm make your tablet/cell phone close to you for your perfect view and easy operation. Innovative flexible ballhead joint construction allows you to adjust the cup mount in 360 degrees. [Tool-Free Installation] -- Expandable base fits most Car, SUV, trucks and other vehicles with standard size round cup holders. [BFF for Drivers] -- It is amazing to have a larger screen for hands-free navigation during your road trip and spend more time at the wheel and eyes on the road. Cup mounting solution will not block your view of the road like the windshield/dashboard tablet car mount, and it will not interface cd player or air conditioner. It is also perfect for off-road entertainment when taking a break on the road trip. - Our tablet stand clamp mount is aiming at providing a enjoy living to all customers. 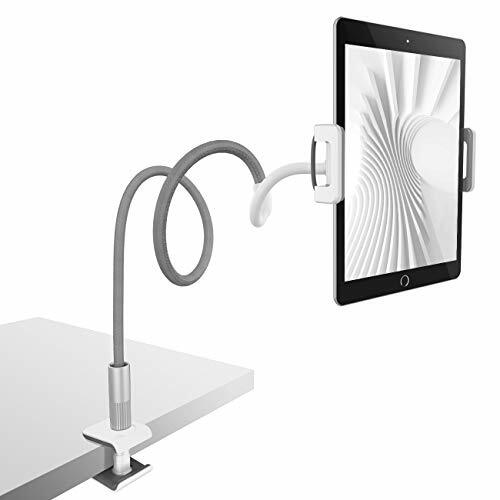 - The arm of this gooseneck tablet stand is especially designed into two parts. Flexible and stable. - The tablet holder is 51.2 inch (130 CM) in length and made of Aluminium-magnesium alloy solid cord for longer life. -The tablet holder can free your hands and make you focus on what you are doing, especially when you are busy in the bedroom, kitchen, gym or office. 1.When you are holding a heavy tablet, you could try to loop the gooseneck into a S shape or circle shape which would provide some more stability. 2.Bend with two hands holding the tablet holder gooseneck when adjusting the position because it is stable. Pull the device violently when adjusting may broke the nut. - Holder only. Smartphone and tablet are not included with the product. - We guarantee a full refund or exchange for any defective items. It's time to free your hand by clicking ADD TO CART and buy it Now! 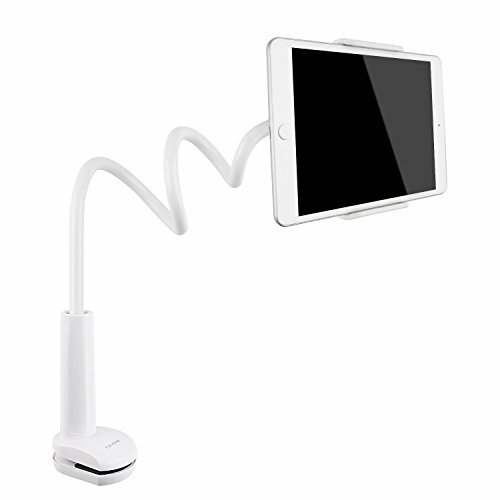 Two-stage Arm The arm of this gooseneck Ipad holder is especially designed into two parts. The bottom part is more sturdy and not easy to shake. The upper part is made of comparatively soft material. Easy to twist. Wide Compatibility Our tablet stand suitable for all 4.7 to 10.5 inch width cell phones and tablets, such as Kindle, iPad Mini, iPad Pro, Samsung Galaxy Tab, Fire HD 8 10 tablet, Lenovo, Nintendo Switch. Stable Struction This iPad stand is made of Aluminium-Magnesium Alloy, stiffened material, very sturdy. Reinforced and thickened base. Won't break easily. Fit for 3 inches(75mm) thickness countertop or headboard. Humanized Design The tablet holder can free your hands and make you focus on what you are doing, especially when you are busy in the bedroom, kitchen, gym or office.Earphone and charging plugs available. You can go on watching movies while the phone is charging. 2. This product is only intended for indoor use or on motionless objects.It cannot be used on moving object such as mountain bike. Also do not fit on smooth poles and handlebars. No More Bored at Gym! Fits all tablet PCs for diagonal size between 7 inch to 12 inch.The expandable tongue and foot design is brilliant.With expanding the tongue and the foot,it holds iPad and other tablets perfectly (mount vertically at top and bottom),and the charging cable space is available. This holder is great for using indoor gym,and simple to install on spin bike,treadmill,elliptical,stationary bike,and holds your iPad steady.It allows you to watch videos on your iPad while doing exercise.This is a really convenient accessory that makes your indoor workouts more enjoyable. Instantly Install and Remove - Easy to install in seconds without any tools.It has high quality quick release strap that makes attaching and removing this mount quick and easy.Setup and attach it to handlebar in Seconds.It is very easy to set up your iPad in the mount.And it holds mobile device securely so you don't have to worry about it falling out. Adjustable Viewing Angle - The ball joint connection allows 360 swivel of the bracket to provide the best viewing angle for your better experience.IMPORTANT NOTE : It is very important to install the snap-on piece in the back correctly,please make sure you have pushed and locked it in place before you set up your iPad in the mount,please take the sixth image on product page for reference.If you don't install this part well,it would be fall off,so please be sure to put it in place. Available for Most Tablets - This universal tablet cradle holder is available for any tablet with a screen size between 7 - 12 .The holder length can be expanded from 4.9-8.8( Make sure the dimension of your device is in this range). No More Bored at Gym! - Perfect iPad Kindle Mount for Indoor Gym Exercise Bikes/Treadmills/Elliptical Bike. 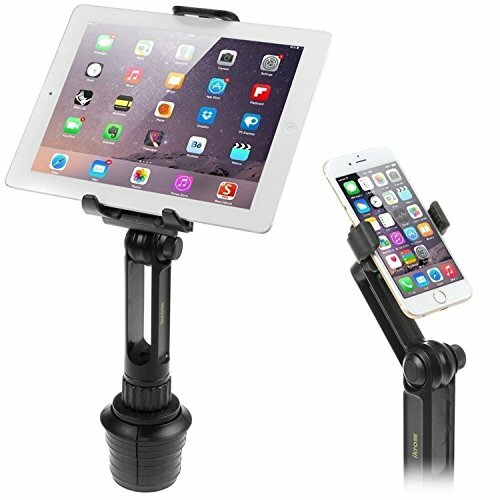 This gadget holds both iPad or tablet securely on 1-2 inch handlebars of most gym equipment with easy adjustment for best view angle to the screen as well as keep maximum safety.Now you can watch videos,stream live bike courses through peloton app,do Facebook video from your tablets for hours when doing exercise.It's really convenient. For a simple and convenient life. Great car tablet holder: car tablet headrest mount for tablets and cell phones from 4 to 11 inch, 7 7 inch, 8 8 inch, 9. 7 9. 7 inch, 10 10 inch, 10. 1 inch, Nintendo Switch. Car headrest mount rear backseat tablet holder for 7 7 inch, 8 8 inch, 9. 7 9. 7 inch, 10 10 inch, 10. 1 inch, 10. 5 10. 5 inch, Nintendo Switch, Samsung Galaxy Tab, Samsung Galaxy 10. 1, Samsung Galaxy S3, Samsung S2, Lenovo tablets, kids tablets, Fire 7, Fire HD 8, Fire HD 10, ASUS tablets, Nexus tablets, Dell tablets, LG tablets, Sony tablets. Car rear seat headrest mount holder, good for long time travel tablet holder headrest mount for iPad, Fire 7 8 10, for kids to kill time in car during long travel. 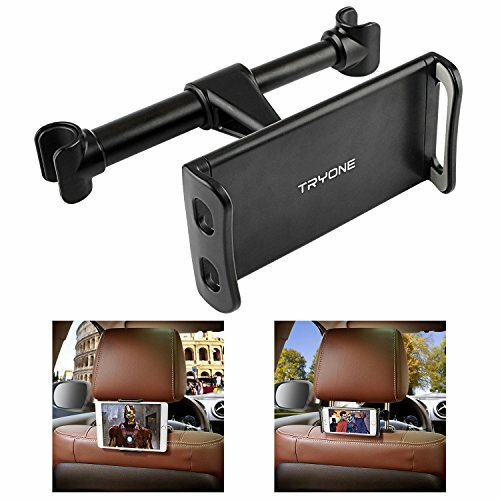 Best car accessories: kill boring time on the car - Raise tablet to your eye level, enable you to enjoy a great movie with cell phones or tablets, playing games with Nintendo Switch, having a video talk with friends or families. Non-compatible car models- Honda Odyssey/Pilot, Subaru Forester/Cross trek/Outback, Mazda CX5, Chevy Traverse, 2007 Toyota Prius, 011 Infiniti QX56v, Audi Q7 (2018). The distance between your car headrest posts should be 5. 1-5. 9 inch. 360 Rotatable & Easy installation The mount is 360 degree rotatable, allows you to adjust your iPad to any Best viewing angle. Just press the headrest mount between back seat. 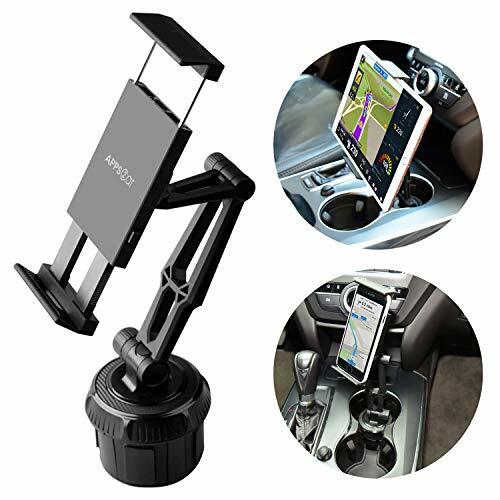 Enjoyable trip This car mount is designed for back seat, mount it between the car headrest to watch movies, read novels, play games and listen to music with hands-free operation during long journeys. Worthown car headrest mount designed to hold any 4.5"-13.3" tablet or phone wide. 4. Applicable for tablet PC with screen between 4.5 and 13.3 inches. 6. This tablet headrest mount is very practical and easy to use. 1. There may be differences between 1 and 3 cm due to manual measurement, please prevail in your type, thanks. 2. Please understand due to the light irradiation or the difference of the computer screen, so I can not guarantee that the photos and the actual color are 100% the same. 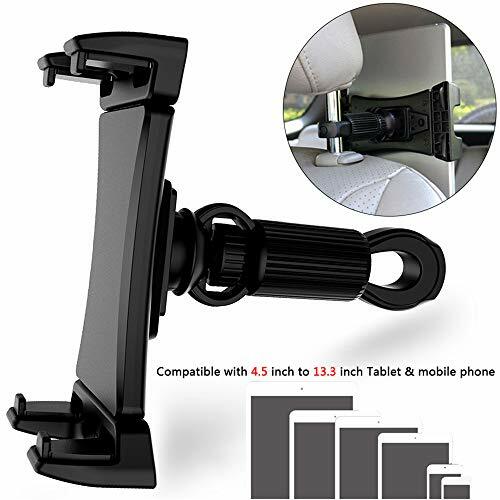 Fit For Most Car Headrest : Adjustable Mount For Tablet and Smartphones deal for most cell phones and tablets Elastic clamp can be streched to 9.25 inch (23.5 cm).The minimum length of the clamp is 4.5 inch (11.4 cm).this Car Headrest Mount Wide Compatibility With Phone & Tablets . Fit for Tripod Mount You can install it on Ball Head of Tripod Quickly.And There is Also Universal 1/4 Screw Mount Compatible with All Tripods and Sliders. 360 Rotation & Easy Installer Insert the mount to the body and pull up to lock,Adjust the holder mount 360 degree in any angle. High-quality & Safe: Mainly made of sturdy ABS plastic(bracket), super durable material last for long. If you are not satisfied with it, please contact us and we will solve it to your satisfaction immediately.